In the first post of the series covering 2Q national Accounts data, I dealt with sectoral composition of growth, using GDP at Factor Cost figures. 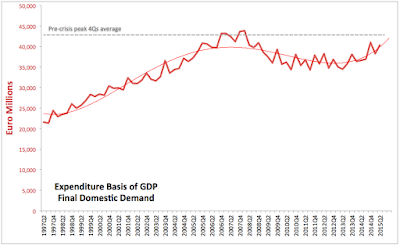 The second post considered the headline GDP and GNP growth data. 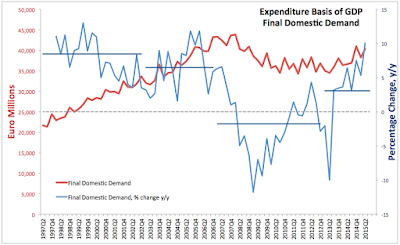 Here, let's consider the Expenditure side of the National Accounts, and most importantly, Domestic Demand that more likely reflects true underlying economic performance, removing some (but by far not all) tax activity by the MNCs. As before, I will be dealing with y/y growth figures throughout the post. 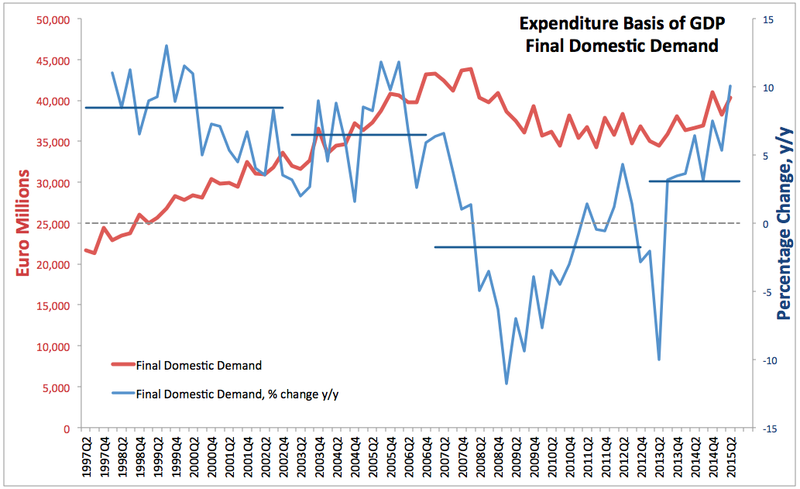 Remember: Final Domestic Demand is a sum of Personal Expenditure, Government Expenditure, and Gross Fixed Capital Formation. Adding to that change in stocks gives us Total Domestic Demand, while adding net exports to Total Domestic Demand and subtracting outflows of factor payments to the rest of the world gives us GDP. In 2Q 2015, Personal Expenditure on Goods and Services rose 2.83% y/y, having previously risen 3.71% in 1Q 2015. The rate of growth in 2Q 2015 was, therefore, slower than in 1Q, but faster than in 2Q 2014 (2.28%). Overall, Personal Expenditure added EUR599 million to the economy in 2Q 2015 compared to the same period in 2014, a drop in positive contribution from EUR784 million added in 1Q 2015. Nonetheless, the figures for Personal Expenditure are healthy. Net Expenditure by Government on current goods & services rose 1.73% y/y in 2Q 2015, which marks a slowdown on 5.45% rate of growth recorded in 1Q 2015. Rate of growth recorded in 2Q 2015 was also lower compared to 2Q 2014 when Government expenditure rose 3.92% y/y in real terms. This marks 2Q 2015 as the first quarter since 1Q 2013 in which Government expenditure rose slower than Personal expenditure. Gross Domestic Fixed Capital Formation posted a massive 34.2% rise y/y in 2Q 2015, compared to already rapid growth of 9.2% recorded in 1Q 2015. It is worth noting that these figures include investments by MNCs tax-registered in Ireland (e.g. tax inversions et al) and vulture funds and other foreign investors' purchases of domestic assets. 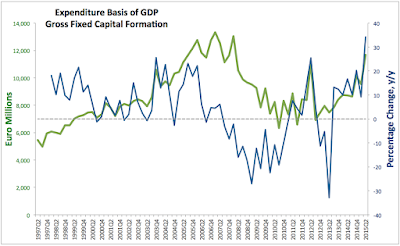 Over the last 4 quarters, Gross Domestic Fixed Capital Formation growth averaged 18.44%. This line of expenditure contributed EUR2.977 billion to GDP growth in 2Q 2015 and in H1 2015 total contribution was EUR3.781 billion. As the result of the above, Final Domestic Demand rose 10.07% y/y in 2Q 2015 - a massive rate of increase, especially compared to 5.34% growth recorded in 1Q 2015 and 6.4% growth recorded in 2Q 2014. We have no idea what drove this uptick, but were Gross Fixed Capital Formation growth running at 1Q 2015 pace in 2Q 2015, this line of expenditure contribution to GDP would have been EUR2.175 billion lower, and overall GDP growth would have been less than 2.1% y/y instead of 6.7%. This just shows how volatile Irish figures are and how dependent they can be to a single line change of unknown nature. Overall, Irish economy posted moderate growth in Personal Expenditure and Government Expenditure in 2Q 2015. Slightly negative news is that growth in 2Q 2015 was slower in these two categories than in 1Q 2015. Gross Fixed Capital Formation posted an unprecedented rate of increase y/y rising 34.2% in 2Q 2015. There is absolutely no clarity as to the sources or nature of this growth, especially considering that traditional investment areas of Building & Construction have been growing at just 1.5% y/y in 2Q 2015. Stripping out growth in this area in excess of 1Q 2015 already rapid expansion would have generated much lower, more realistic growth figure for GDP and for Domestic demand. Final Domestic Demand expanded strongly on foot of Fixed Capital Formation, rising 10.1% y/y in 2Q 2015 almost double the 5.3% rate of growth recorded in 1Q 2015. One area of potential concern is the impact on Domestic Demand (via Gross Fixed Capital Formation) from the MNCs activities via MNCs inverted into Ireland. There are multiple examples of such inversions across various sectors all having potential implications on how we treat investment by such firms in National Accounts. Another area of concern is treatment of capital investments by some financial firms, such as aircraft leasing firms and, increasingly, vulture funds and REITS. Analysis of external trade flows is to follow, so stay tuned.